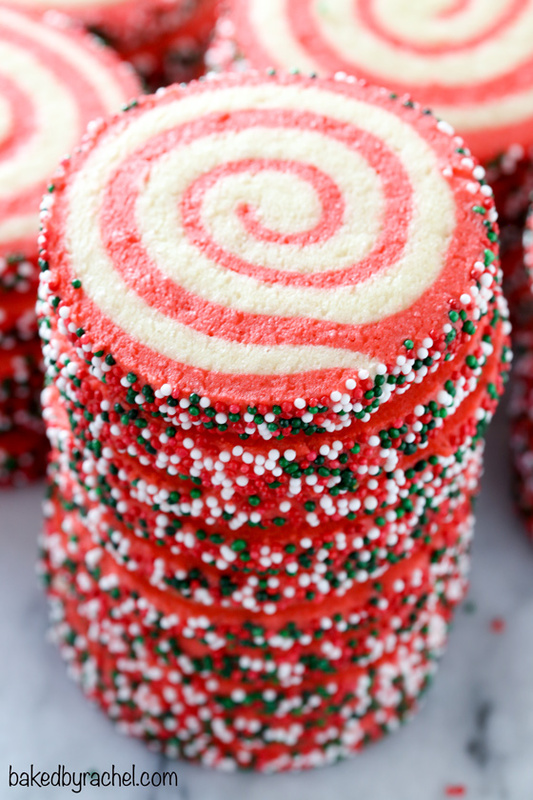 An easy and festive pinwheel cookie, perfect for the Christmas season! 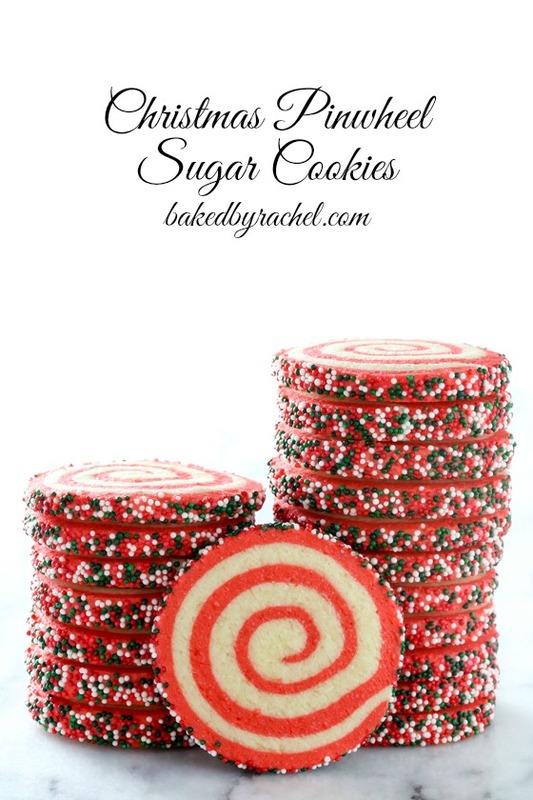 A must make for all sugar cookie fans! We’re officially in the home stretch… less than two weeks until Christmas! Are you done with your shopping or have you not even started? I’m mostly done. I keep telling myself just one more thing. One more thing turns into two and then I have to even it all out again. Tsk tsk. I know! Sometimes I just can’t help myself! Surely this doesn’t just happen to me! Also, is it just my kids or are all kids obsessed with movies where animals talk? Like, real life animals that are made to look like they’re talking… or even singing? And I’m not even talking about all of the Air Bud type movies, which we’ve never seen. We were in a talking dog movie kick over the weekend. It started with Santa Paws, which btw, is a really cute Christmas movie. If you have little kids, it’s basically a must watch. So, I’m not complaining… but… Santa Paws led into Santa Paws 2. And, we also have the third recorded, in addition to Snow Buddies. I’m positive there are even more holiday talking animal movies. And I’m sure my kids will find them all. So many talking animals… so little time! We have our first official snow day of the season. I’m debating between spending all day in the kitchen or snuggling up and finishing my book. I’m currently on the second of the Slammed series… Point of Retreat. Just as good as the first and I’m flying through, which is both good and bad. I’m dying to keep reading but I’m also sad that I’m flying through because that means one less book I’ll have to read of hers. I only have a few left before I’m done with all of them. Then I’ll be on the hunt for a new author to binge on. Pinwheel cookies are probably one of my favorite special cookies to make. I love the swirls and they’re so customizable with different colors, sprinkles and flavors! The possibilities are truly endless. It was time I finally made a festive version for the holidays. Colorful cookies are always a big win with the kids… or anyone for that matter! And even more so if you’re a sugar cookie fan! Don’t be intimidated by pinwheels. They may look hard, but they’re really easy. And, this dough is SO easy to work with! The hardest part won’t be making the cookies… it’ll be not eating all of them! So good. 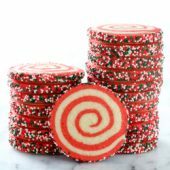 Soft and colorful, holiday inspired pinwheel cookies! A perfect cookie for your next cookie exchange, holiday party… or the big guy! Santa would definitely love these. 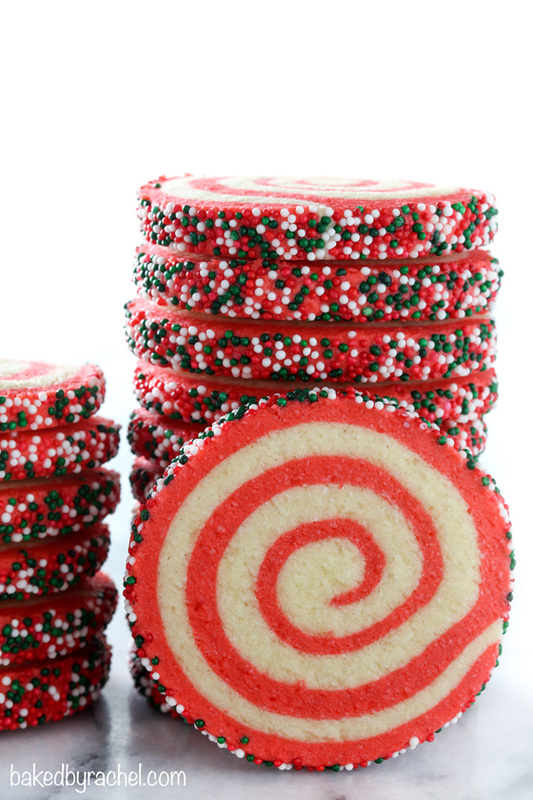 Make sure these easy pinwheel Christmas sugar cookies are part of your holiday baking plans! In the bowl of a stand mixer, cream together butter and sugar until light and fluffy. Mix in eggs and vanilla, followed by salt and baking powder. Scrape the bowl as needed. Mix in flour, adding one cup at a time. Continue mixing until fully combined and no streaks remain. Divide dough into two equal portions. Return one half of the dough to the bowl. Add 5 drops of red gel food color to the bowl. Mix until dough is evenly colored. Place untinted dough between two large sheets of wax paper. Roll out dough to a 9x16-inch rectangle. Transfer dough to the refrigerator to chill, keeping both sheets of wax paper in place. Repeat process with red dough. Refrigerate both layers of dough for 15-20 minutes. Place the red dough down first, removing the top layer of wax paper. Remove one sheet of wax paper from the untinted dough. Carefully flip the untinted dough down onto the red layer. Remove the remaining top layer of wax paper. Trim the dough to an even rectangle. Beginning at one of the short ends, carefully roll dough into a tight log. Pull up gently on the remaining layer of wax paper to help roll the dough. Wrap dough log in wax paper. Wrapped dough may be placed inside of two large drinking glasses or the center of a paper towel roll cut down the length. This will help to keep it's round shape. Refrigerate for at least 2 hours or overnight. Add holiday nonpareils to a large shallow dish or tray. Unwrap dough log and begin rolling in the sprinkles. Continue rolling and pressing sprinkles into the dough until it is completely covered and no dough shows through. Rewrap in wax paper. Refrigerate for an additional 1-2 hours. Preheat oven to 350°F. Line a baking pan with a silicone baking mat or parchment paper. Unwrap the sprinkle covered dough log. Slice off the end. Carefully slice 1/4-inch slices, spacing roughly 1-2-inches apart on the prepared baking sheet. Return remaining dough to the refrigerator until ready to slice and bake. Bake cookies for 10 minutes. Allow cookies to sit on the pan for 1 minute before transfering to a wire rack to cool completely.